At the end of the follow up period, 83% of the 64 treated sites showed recession reduction whereas 48% of the 64 untreated sites experienced increase in recession. Treated sites ended with gingival margin 1.7 mm more coronal and keratinized tissue 3.3 mm wider than untreated sites. Sites treated with gingival augmentation procedures resulted in coronal displacement of the gingival margin and reduced recession, whereas the contralateral untreated sites showed a tendency for increased recession and a tendency to develop new recession during the 18 to 3 year follow up. 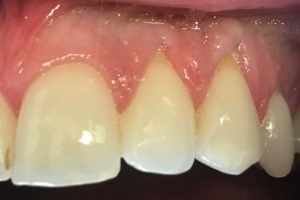 Periodontal conditions of sites treated with gingival augmentation surgery compared to untreated contralateral homologous sites: a 10- to 27-year long-term study. Agudio G1, Nieri M, Rotundo R, Franceschi D, Cortellini P, Pini Prato GP.